One of the interesting stories of World War II is about the change in the role of women here in the U.S. We often hear about more women joining the workforce in the early 1940's to fill in for all of the men who were off fighting the war. We hear about "Rosie the Riveter" as a symbol of the women who took on new positions in factories. But we don't hear much about the thousands of women who actually helped bring about the end of the war. 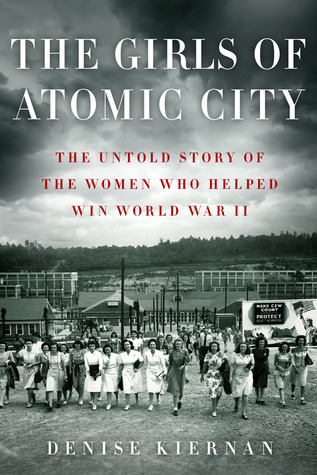 The Girls of Atomic City by Denise Kiernan is the story of those women, particularly the women who left everything they knew to move to a town that didn't really exist to do a job they didn't really understand to somehow help their fathers, brothers and friends come home. Thousands of women (and men) were recruited to work in a newly developed area of the Tennessee mountains. No one knew anything beyond their own job, though. They were sworn to secrecy. People didn't ask "What do you do?" when they met someone new. That question was off-limits. Kiernan tells of this unusual way of life through the eyes of several young women who worked at Oak Ridge: a nurse, a statistician, a pipe leak tester, a chemist, a janitor, a couple calutron cubicle operators and a couple secretaries. These women came to their new home and learned to live with the muddy ground, the primitive housing and the secrecy. Each did their job, but they didn't understand the big picture. The statistician understood how to calculate percentages, but didn't know what those percentages were for. The pipe leak checker didn't know what was flowing through the pipes. The cubicle operators monitored their gauges and adjusted controls, but didn't know what the readings meant. I found this story fascinating. I didn't honestly know anything about Oak Ridge or about how the U.S. government managed to secretly develop the atomic bomb. I certainly didn't know about the role of women in its development. I enjoyed the social history aspect as well, hearing about the way these women, and all of the people who lived in Oak Ridge during the war, learned to live together and make a community out of nothing. I even enjoyed the chapters that got into the actual science related to fission and enrichment of the uranium. I will say that the writing was a bit repetitive at times, and although there were several main characters featured throughout, I had a very hard time keeping track of them. They didn't interact with one another, so this made it a bit harder. Kiernan did a good job finding a variety of women in terms of jobs, backgrounds and experiences, so this helped give a wider view of life at Oak Ridge. But I didn't feel connected to any of the women specifically. Overall, this is a great look at an amazing time in history. Learn more on the author's website, Facebook or Twitter. This review was written based on a copy of The Girls of Atomic City that I received from Wunderkind PR in exchange for an honest review. Sounds fascinating! I've heard a lot about this book. Thanks for the review! This does sound like a really interesting slice of history. I've never heard about it either, but I'm glad that books like it and The Wives of Los Alamos are getting published. Great review, thanks! Yes, it's great to see these stories get out there!